The South and North Korean co-chiefs of a joint liaison office agreed Friday to continue to work closely together in the new year to further move inter-Korean relations forward, the unification ministry said. Vice Unification Minister Chun Hae-sung met with Jon Chong-su, vice chairman of the North's Committee for the Peaceful Reunification of the Country, at the liaison office in the North's border town of Kaesong. "Both sides assessed that there has been much progress in inter-Korean relations this year and that the liaison office has played a meaningful role in the process," the ministry said. "They also agreed to continue to cooperate in 2019 in advancing inter-Korean relations and having peace take root," it added. 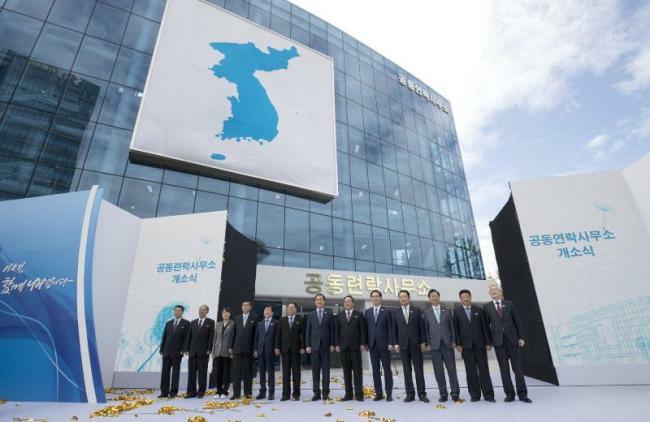 The two Koreas launched the liaison office in September for round-the-clock communication aimed at helping foster cross-border exchanges and easing tensions. Chun and Jon agreed to hold a meeting every week to exchange views on cross-border issues, but the previous co-chiefs' meeting was held on Dec. 7.